Top Ten Tuesday - 10 Movies I Love! 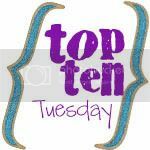 This is my second edition of Top Ten Tuesday hosted by Amanda who blogs at Oh Amanda. Please note: this list is not in preferential order. The Man from Snowy River - I love all of the scenery in this movie, the music, and the suspense. I like this movie so much my sister, Heidi, played Jessica’s Theme on the piano during our wedding ceremony! I also found out today that my Mom went into labor with me while she was watching this film. Maybe that's a reason I love it so much! Little Women (the 1994 version with Winona Ryder & Kirsten Dunst) - “[Amy speaking of Jo’s hair cut] Oh Jo, your one true beauty”. Anne of Green Gables and Anne of Avonlea (with Megan Follows as Anne) - Gilbert Blythe must live! My Fair Lady - I love all of Eliza’s beautiful dresses and hats. The scene at the horse racetrack is quite memorable! There you have it! What are your favorite movies?